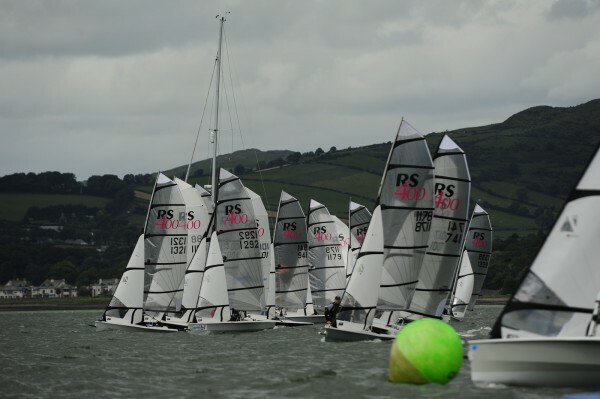 Hastings pulls off first ever perfect 360 at Carlingford RS400 Northerns. It was a case of perpetual disorientation, but also a high point for Hastings, one of the fleets main movers and supporters, as he judged the spiralling wind, or Carlingford Kettle, to perfection. As those around him thrashed around helplessly, Hastings bore off in a smooth arc, with crew Neil Calvin maintaining perfect kite trim, and scribed a perfect circle, with no adjustments to sheeting angle, truly an incredible sight for all to witness. 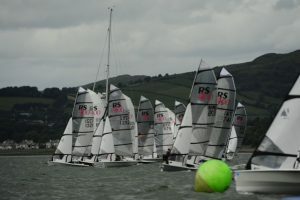 As the mini tornados spun their way across the lough, availing of the unique local topography, many others did the more traditional 360 rotation, with the rig passing under the boat, and so it came to pass that we had a very odd days racing on Saturday. With a similar South Westerly breeze forecast for theSunday, many went to bed worried about another day of randomness. Other notable performances were from Paul McLaughlin and Mick McKinley in 9th, and a strong showing from George Kingston and Ian McNamee in 7th, taking a split decision over the highly talented, but well past sell by date pairing of DrC and Stevie Kane, who shocked themselves by posting the best total over three raceson Sunday (only getting this mention as I am writing the report obviously). Alex Barry, sailing this time with Andrew Lane finished an unaccustomed 6th after being joint leaders overnight.